I get at least 1 email a day from my readers. I try to respond to everyone eventually with a personal email from me. I cannot afford a personal assistant so do not think you are getting a canned response. I try to respond to all my readers' inquires within a week, depending on my TDY and work schedule. I saw your post on Reddit and have read some of your site and love the advice you have given. I am 24 years old and a 2d Lt in the USAF. I have paid off my student loans and am getting an O-1 salary while going to medical school at USUHS. I was wondering with regard to the Roth IRA, which funds exactly you recommend investing in? 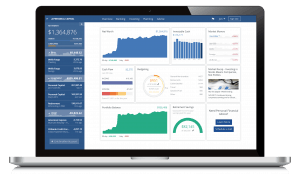 As of right now I have my funds in the USAA Nasdaq 100 Index fund, but was not sure if I should switch to Vanguard like you said, and if so, which funds to select and how much it would cost to switch from USAA? I am also contributing about 20% of my base pay to the Roth TSP, and was wondering if you would suggest selecting the L2050 or a different one? First of all, as a medical student (and especially a military med student) you must read The White Coat Investor blog and also buy the 87% 5 star Amazon rated book. Dr. James Dahle writes well about achieving financial independence rapidly and living a rich life as a medical professional. He also became a doctor through military medicine, similar to what you are doing. Why the NASDAQ 100 index fund (USNQX)? What makes you think the 100 largest stocks on the NASDAQ exchange are going to outperform the U.S. stock market as a whole? Why do you think technology stocks are going to outperform the market for the next 10, 20, or 50 years? My asset allocation may not be appropriate for everyone, so here are a few more good ideas from the Bogleheads. Pick an allocation, have a good reason for picking it, and then stick with it for at least a few years. If you are thinking of changing it, have a good reason. While USNQX may seem to be an index fund, really you are just tilting towards technology stocks. It's not a broad market index fund. This induces market sector risk. Rather than putting all your eggs in one sector (technology), why not diversify across all sectors with the Vanguard Total Stock Market Index Fund (VTSAX)? Take a look at the top ten holdings of the USNQX: Apple, Microsoft, Amazon, Facebook, Alphabet (AKA, Google, and two classes of Google shares), Intel, Cisco, and Amgen. All technology stocks. While some of these are also the top ten holdings of VTSAX, USNQX is missing a solid chunk of the US market. If that is what you are going for, fine. But have a good reason for deviating from the total market index. USNQX carries an expense ratio of 0.57% (57 basis points). Over 50 years, with a 6% investment return, you will lose 25% of your returns to fees! 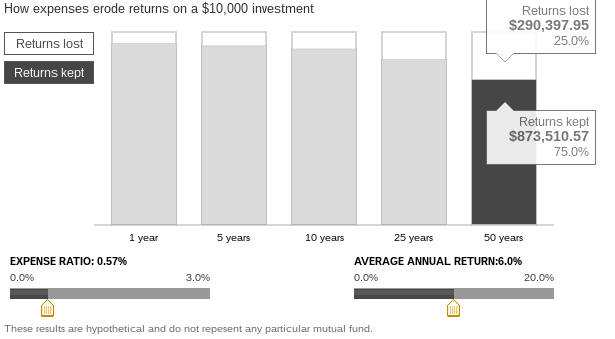 Costs are the number 1 determinant of your returns. Minimize your costs. If you can get your costs down to around 0.10% (10 basis points), you can keep 95% of your returns, rather than 75%. In the example above, that is nearly a quarter million dollars! You can run the data for yourself here. Costs are one of the few things you can control when investing. It is imperative to keep them as low as possible to give yourself the highest probability of investment success. Get out of USAA for your Roth IRA. The costs are too high. Liquidate the assets inside the USAA Roth IRA, and rollover the account to Vanguard. Vanguard should be able to help you with the paperwork and it should be a fairly painless process. The cost of switching should be minimal. I do not believe Vanguard will charge you anything. USAA may charge you a bit (probably under $50) for leaving them. Select an intelligent asset allocation. The most basic is picking a stock/bond ratio. Then choose the Vanguard funds that represent the stock and bond markets you want to index. I use VTSAX and VBTLX (Total Stock Market and Total Bond Market). I also throw in a dash of international stocks with VTIAX. 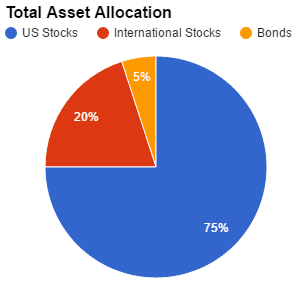 Again, check out my asset allocation from last year. It probably will not change much this year. It may not be appropriate for you, so do your own research. I am quite heavy on equities, with the understanding that my portfolio will be more volatile. As for the TSP, the costs are the lowest in the world. You really cannot go wrong picking any TSP fund, when it comes to costs. Well done contributing 20%. Keep that savings rate high and you will achieve FI in no time as a doctor. If you do not know what you want to do for asset allocation, pick the Lifecycle Fund with the further date out (L2050 at the time of this writing). Then, learn more about asset allocation if you want to set up your own. I recommend the Bogleheads guide or William Bernstein's book. If you don't care to learn about asset allocation, a Target Date Retirement or Lifestrategy fund from Vanguard and the Lifecycle fund from the TSP will serve you just fine. John Bogle recommends just your age or your age minus ten in a total bond fund, the rest in a US total stock market fund. Warren Buffett's advice to his wife's estate manager after he passes away is a 90% S&P 500 Fund (basically total US stock market) and 10% in government bonds. It really is that simple. I recommend (of course) reading my book, but also John Bogle's book on indexing. A Random Walk Down Wall Street should also set you on the path towards index investing zen. The two previously mentioned books should be available at your local library. Hopefully mine will soon be as well. I currently have all my investments through USAA, half in a Roth IRA and the other half in a mutual fund. Each “fund / account” is divided into USCRX, USSPX and USCGX. I just retired from the military and about to receive my first monthly retirement check. I don’t need the extra income and want to start a separate account to see it grow on its own. 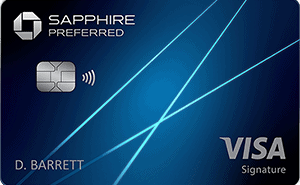 I’m debating going away from USAA and starting a Vanguard account, thoughts? My initial thought is maxing out my IRA contributions by starting a Traditional IRA and then putting the rest in another fund, possibly the Vanguard STAR Fund (VGSTX). On another note, can you recommend a high interest savings bank? I have a good amount that is sitting in a USAA savings account and learned how low the interest rate is compared to other banks. A month ago I googled High Interest Saving Accounts and saw upwards of 5%, but today I can only find about 1.6%. Why those USAA funds? Check out the expense ratios. Over 1% on 2 of them! And the S&P 500 fund has a .25% expense ratio. You could buy the Vanguard 500 Admiral Fund VFIAX at .04% and save yourself thousands over a few decades of investing. Check out Vanguard’s fund comparison calculator here. Also, I don’t know of any banks offering more than 2% on savings accounts. Here’s a good list on MyMoneyBlog of the best interest rates on cash. I just can’t find the answer. Is the NASDAQ represented in the TSP? Yes, indirectly through C and S funds. All companies traded on the NASDAQ are contained in the C and S fund. For example, American Airlines, Apple, and Adobe are all traded on the NASDAQ and contained in the C Fund. Spencer, I’m curious on your thoughts of Betterment streamlining their prices. I’ve already started the rollover process to Vanguard with mine and my wife’s taxable accounts. We were some of the ones that got shafted from 0.15% to 0.25%. It’s still a decent price for what you get out of it, in my opinion, but I see them raising prices again in the near future. Also, how hard can it be to DIY through Vanguard? Seems pretty straightforward so far. Brandon – I think they really messed up with their transition to the 0.25% fee structure. They could have grandfathered everyone in or at least given much more warning. I still think Betterment is a good product, especially for those who are just starting out or do not have the DIY investment drive. I was only in the 0.25% bracket (just broke $10,000 last year) so it did not affect me. If they raise prices again in the future, they will certainly lose any trust they have left with their clients. If they raise prices again or take another trust-losing action like they did, I would no longer promote their product on my site as an affiliate. It is not hard to DIY at Vanguard. I do it myself. With their Target Date Retirement funds and LifeStrategy funds, you can get a simple, automatic, diversified, and low cost all in one fund. For instance, their LifeStrategy Growth Fund (80% stocks, 20% bonds) is only 15 basis points or 0.15% expense ratio. That is 10 basis points cheaper than Betterment with many of the same features. Or you can build your own low cost asset allocation with their total bond, total US stock market, and total international funds. Very easy to do and very cheap. The core of my portfolio is in the TSP and Vanguard. I keep my Betterment account open to gain robo-adviser experience. Also, keeping an account open ensures that recommending Betterment to those just starting investing (like my young family members just graduating college) is still a good idea. Great advice Spencer! I don’t think you can steer people wrong with a VSTAX recommendation, especially if they are just in whatever fund they started out in and can’t justify not switching… and the fees! I cant wait to switch out of my wife’s 403b, currently with TIAA for her company match. I’ve already opened her a Vanguard Roth IRA in advance of her departure this April!